Apart from eating them directly from the pods, there are lots of other different ways that you can use edamame, such as tossing the beans into salads and stir-fries. 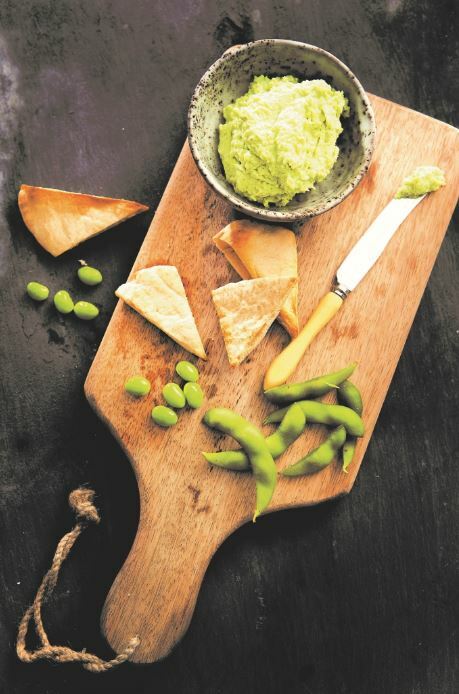 This recipe is one of my favourite ways to use edamame. You’ll need a pestle and mortar and a blender to make this recipe. 1. Toss the sesame seeds into a roasting tray and place in a fan oven preheated to 150ºC for about 5 minutes. 2. Using a pestle and mortar, grind the hot sesame seeds until most of them are cracked and ground. 3. Cook the edamame, then drain. If still in the pods, remove by using your fingers to gently squeeze the beans out. 4. Place the cooked edamame beans, ground sesame seeds and the remaining ingredients in a blender and blitz until the texture is nice and creamy. 5. If you think the mixture is too dry, then add a little more olive oil or water.